Want to see a sunken kitchen design in a modern apartment? You'll be amazed! There are different ways to design a kitchen and other parts of the home. But one interesting way is to go lower or upper the floor level of the house in order to give depth into the area. Most of the time, we have seen sunken living rooms but other areas of the house can also be sunken as well. I always find it interesting when some spaces in the house are either sunken or elevated instead of just leveled with the rest of the home’s flooring. What we are going to feature today is a multi-floored apartment that has a sunken kitchen created by MAMM Design. 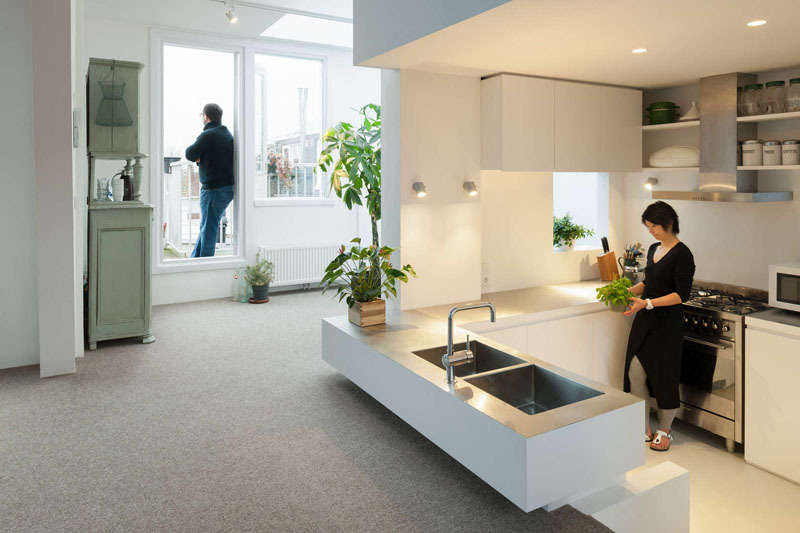 The apartment which is located in an 85-year-old building in Amsterdam includes a rarely seen sunken kitchen design, which is the highlight of the home. The entire interior has white colors in it and added dramatic lights to enhance the space. But what I find even more interesting apart from the sunken kitchen is the lofted play area above it. Who would think that a play area can actually be added above a kitchen? Because of its sunken design, more ceiling space was added allowing a lofted part to be added. Isn’t that nice? Now let us take a look at the images of the interior below. 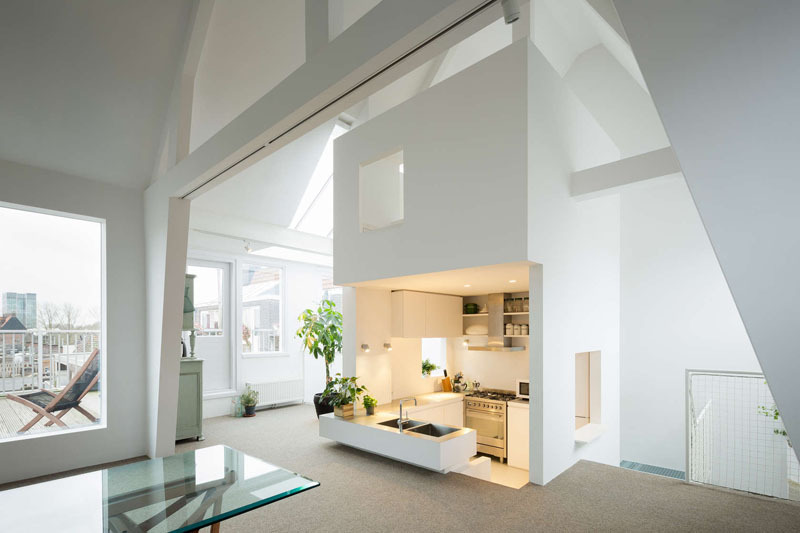 Unique feature: This apartment highlights a sunken kitchen area with a lofted play area above it. 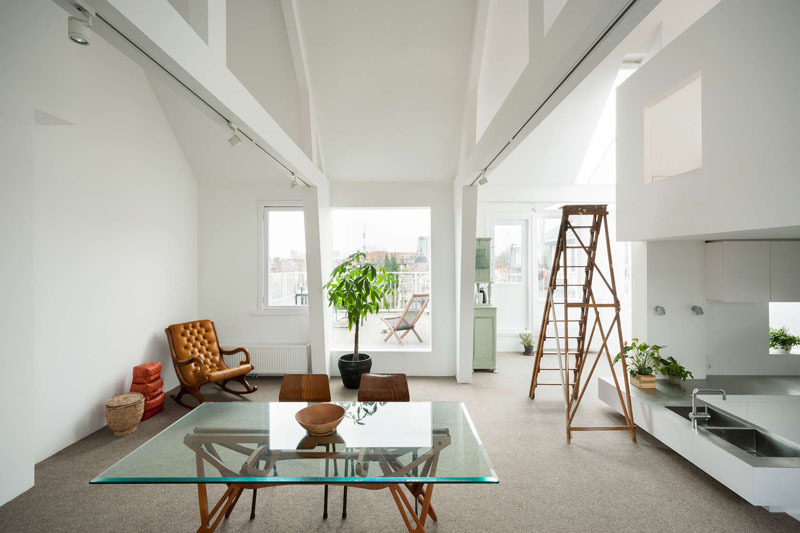 In this image, you can see the sunken kitchen which would indeed bring your attention to it because it is positioned near the door and who wouldn’t notice this space with a lofted area? I like it that is placed just near the living space to allow interaction. Seen here is the staircase that leads to the lower level of the apartment. Notice the unique mix of materials in the stairs and also how calming the colors and layout is for the area. It is also a great idea to add plants in it. What you can see here is actually the living space. 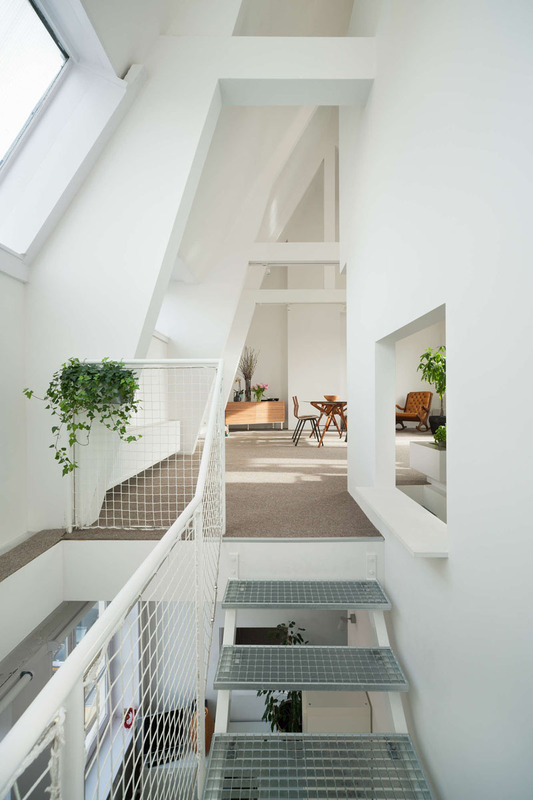 The interior of the apartment has all been painted white to aid in the reflection of light, with the lofted ceiling adding to the feeling of space. You can see the mix of furniture in the living area but it doesn’t look crowded or over decorated. Central to the design of the apartment is the tower where all of the plumbing is located. It also houses the kitchen, a play space, and bathroom (on a lower level). Now that sure is a very intelligent way of designing! The kitchen has been sunken down in order to separate it from the main living area and also to allow more space from the floor area to the ceiling, hence being able to add a lofted play area. You can see here that the kitchen has everything that one needs to prepare and cook food here. Aside from being near the living space, it is just also near the dining area. It is novel to think that in order to reach the small play space for the children above the kitchen, one would climb a wooden ladder. It would definitely be fun to do that but one also has to be extra careful to avoid accidents. 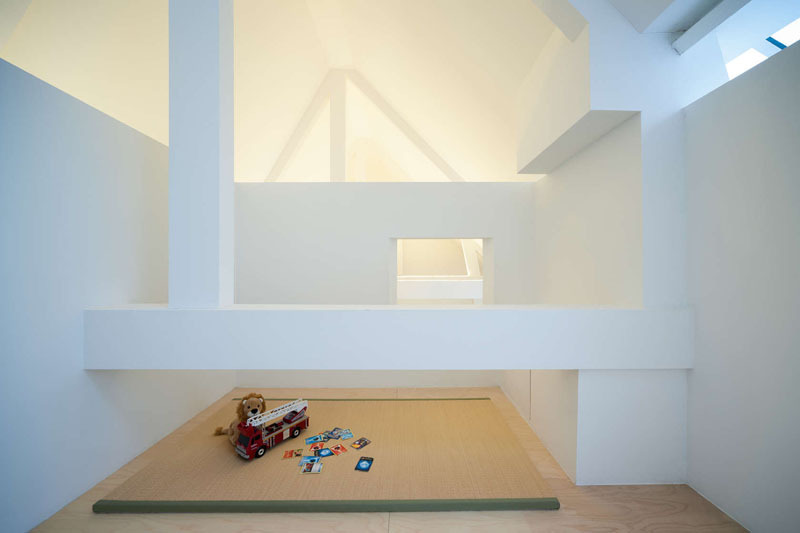 If you are curious on how the play area looks like, it is just this- a minimalist interior with white walls and wooden flooring. Nope, you won’t even see childish posters or a wall display of toys. It is just as simple as this. This is the exterior of the house and we can see that it indeed has an old design that since it was built 85 years old. Isn’t it amazing that it is still standing up to this date? And for sure, everyone who visits the area will be amazed to see beautiful units in it just like this one that we have featured today. 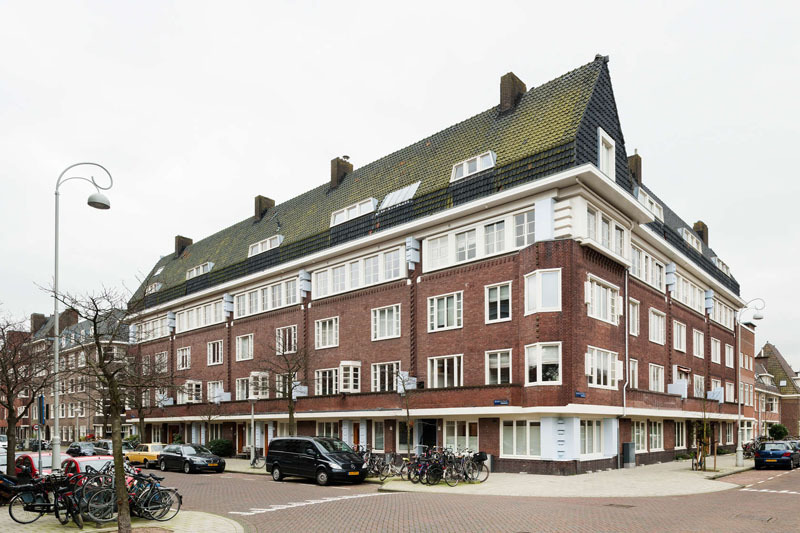 Although I am not sure if all units are beautifully designed, it is still a nice idea that you are actually looking at a building that has been there for years. Nice idea, right? I am sure that after seeing this kitchen, you feel like having one similar to it as well. This is one kitchen design that is totally different from other kitchens. This lovely kitchen is fromMAMM Design who gave this house a unique cooking area that also added appeal to the space. It also added depth into the home and it sure is an interesting feature that will make guest envy their home. Another good thing is that although it is sunken, it has everything one needs in order to prepare food for the entire family. And one can do that while conversing with those in the living area. Nice idea, right?